As I raced inside to the fire after feeding the homestead animals, leaving behind gusty cold winds and a storm peeking over the mountains behind us, I glanced in the mirror. A red nose dotted my face, and my icy fingers were chilled. The Fall leaves blew past the window. You know what I did? I made myself some warming, delicious Chai Tea. I've created two favorite Chai blends, and I'm going to share both of them with you. Perfect to warm up with, both lovely to look at, and they make perfect gifts too! Chai actually means "tea" in Hindi---so when we Westerners say Chai Tea, we are really saying "tea, tea." However, for us, saying chai usually evokes a certain flavor and type of tea. So, in my opinion, saying "chai tea" is absolutely fine. Chai dates back over 5,000 years and was created traditionally as a healing tea. Over time, it has become a staple in many cultures in India and Asia. There are many recipes for chai and ways to drink it, but the common denominator is that it is spicy and usually contains some typical herbs: Cinnamon, Cloves, Black Pepper, Cardamom, and Ginger will be found in almost every Chai. Most traditions sweeten their Chai with honey or other sweeteners, and often add milk. The basic tea leaves used in modern chai teas include variations of Camellia sinensis, yerba mate', or even rooibos leaves. One thing people always ask, "Is chai tea good for you?" My answer is absolutely, "YES." If black tea is used, it will have much less caffeine than coffee (about a third less per cup), plus Chai is filled with anti-oxidants and spices that stimulate the digestive and circulatory system. Now that we've gone over some Chai basics, here are two lovely blends you can make yourself to give as gifts or enjoy by the fire as the days get colder. Although, you can and should enjoy chai year round, in my opinion. FTC Disclosure: There are affiliate links scattered throughout this article for your convenience. If you happen to click through and make any kind of purchase, I may earn a very small commission at no extra cost to you. Here are my two favorite Chai Tea Recipes: Green Tea Chai and Rosy Chocolate Chai. They are perfect for gift giving, enjoying on cool days and colder nights, and are wonderful teas for health! Make your own tea blends, and package them up for perfect homemade. holiday gifts! Where to Buy Your Herbs? If you're going to blend your own teas, you'll probably need to make some herb purchases. At least I do. I can't grow the exotic herbs and spices up here in our desert mountains, although I wish I could! I always buy my herbs at Starwest Botanicals because they have great quality, choices in quantity, and ship quickly. Starwest also has their own tea blends all ready to go! So, if you don't really want to mess with blending your own teas, you can purchase one of their bulk blends. I've never been disappointed in their blends. You can find all of the herbs in these recipes at Starwest Botanicals! Blend the parts together, and you have a lovely tea! Store in an airtight glass container (I just use a Mason jar), out of the light and heat. This is the Green Tea Chai. Isn't it gorgeous? I created this blend because 1) it's super pretty; 2) I wanted a chai with Cocoa Nibs; 3) I love Roses! What woman doesn't love chocolate and roses, right? Here you go! Enjoy! *** 4 parts Organic Rose Petals (Using organic roses is important, because they are heavily sprayed in some areas. This tea has been a huge hit with my friends and family! Like the first Chai, just blend all the herbs together and store in an airtight container. Remember to take a look at Starwest Botanicals, my favorite place to get herbs and oils! Here is the Rosy Chocolate Chai...Ravishing! Use 1 Tbsp to one cup of water. You can use more if you like your tea strong, like I do. Pour just boiled water over your chai. You can use an infuser cup (this one is my favorite, and I have two of them), or use some kind of container (like an organic reusable cotton muslin bag or stainless steel tea ball-at least 2 inches) to hold your herbs. Alternatively, if you don't have an infuser, no problem! Just pour your water directly over the herbs, then strain out the herbal matter. My husband actually just munches on some of the herbs as he drinks instead of straining out the herbs. Personally, I like my tea clear. Let steep for about 20 minutes. If you want it stronger, it's ok if it infuses for a longer period. One thing to know about green and black teas, though: they have a lot of tannins and can get bitter if allowed to steep TOO long. Strain out the herbs OR if you've used an infuser, just remove it. Now you can add your sweetener and/or some milk for a more traditional Chai if you want! You can package up your teas in some very pretty containers! Be creative! I have difficulty with creativity, and I'm not really very crafty, but I have found that using tea tins with a clear top allows the tea to be seen, and people love seeing the beautiful herbs. You can use some holiday ribbon to secure the tins and make it pretty---and there you go! Perfect ideas to give along with your handmade tea blends include tea accessories. How about a pretty tea infuser cup? Or some organic Muslin bags? How about a nice glass tea pot? You can pick and choose then package everything up in a lovely basket! You can really get creative with your tea blends when gifting them to friends and family. There are more tea blend ideas on my website, such as Happiness Tea, and Lung Support Tea too----if you want to blend other teas and not just stick with Chai tea. There's more on the website: Just search "tea." Get the eBook for over 22 tea recipes and gift ideas, plus herbal knowledge for health. Also available on Amazon Kindle. 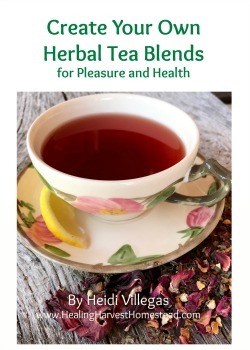 And, if you want to know all the basics about tea blending for medicinal purposes and health AND for pleasure, you need to take a look at my eBook, "Creating Your Own Herbal Tea Blends for Pleasure and Health." You'll find lots of herbal information and tea-making/blending information as well as twenty-something tea blends you can start out with. There are also charts and lists with ideas so you can make adjustments for your very own creative blends! Once you begin learning about and using herbs both for enjoyment and health, you'll never go back to processed teas again. The great thing about blending your own is that there are NO chemicals, processed or unnatural flavorings, or stale bags to deal with. You'll have fresh, beautiful, flavorful herbs in every cup! Have you ever blended your own teas? What are your favorite things to use in your teas? Do you have a great infuser you'd love to share with us? Leave comments and questions in the comments! I'd love to hear from you! Disclaimer: I am not a medical doctor, and any statement made in this article, in any publication, or elsewhere on my website is for informational purposes only and is simply my personal opinion based on years of study and experience. Please seek medical advice from a professional for any health issues. Nov 7 Make Your Own Herbal Chai Tea: Try Rosy Chocolate Chai! You'll LOVE It!